Your BlackBerry makes it incredibly easy to stay up on the latest news, whether you want to know world events or the latest sports score. 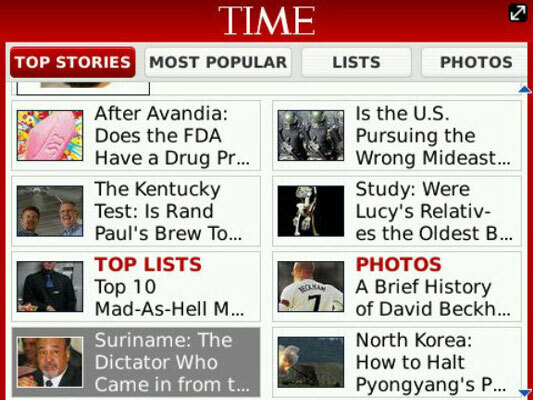 These apps give you the best and brightest of online news as presented on your BlackBerry. Associated Press (AP) stories form the foundation of much of the news you read in newspapers. 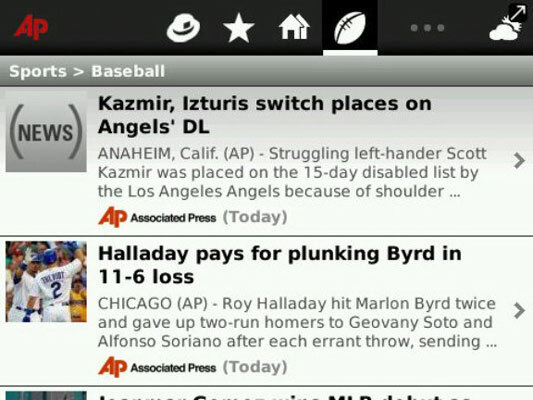 Consulting the rapidly changing AP Mobile on your BlackBerry is also a way to keep up-to-the-moment on breaking news. When you first run AP Mobile, it asks you for your local Zip code, and from that, it finds the nearest major newspaper with its own Web site; if there’s more than one AP member, the assignment will be made by a computer somewhere. Changing the Zip code to select a different hometown is useful if you want to follow local news from afar, or if you are traveling and want to know the headlines from the place where you and your app are. The CNNMoney app is an invention specifically for the smartphone that brings together some of the features from the CNN newsroom and its corporate magazine cousins Fortune and Money. CNNMoney is very nicely designed, presenting a great deal of information on a small screen, and its navigation is obvious and easy. 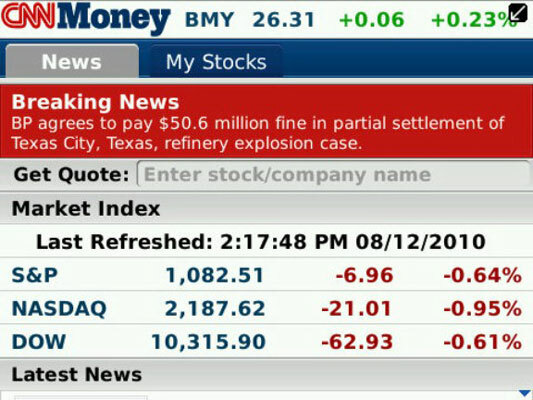 There’s a nice suite of customization options: you can turn on or off the display of market indexes and do the same for sections, including the latest news, company reports, real estate, small business, technology, and personal finance. There are also portals to articles and columns from Money and Fortune magazines. 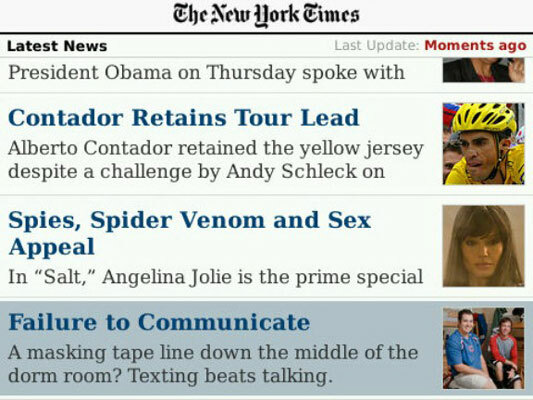 The New York Times Mobile, in its BlackBerry version, takes the online newspaper one step further: It recasts the front page into a clickable list of headlines and reformats the stories themselves into easily read snippets. The Times has announced plans to institute some sort of a subscription fee for the newspaper. The mobile version includes the full text of most stories. Special features include blogs that are exclusive to the electronic versions. With the arrival of the Internet and after that the spread of smartphones, it was only natural that the Globe and Mail (the Canadian national newspaper) would arrive on the Web and then on the BlackBerry. What you get is very Canadian: solid and unpretentious with a nice sense of humor. 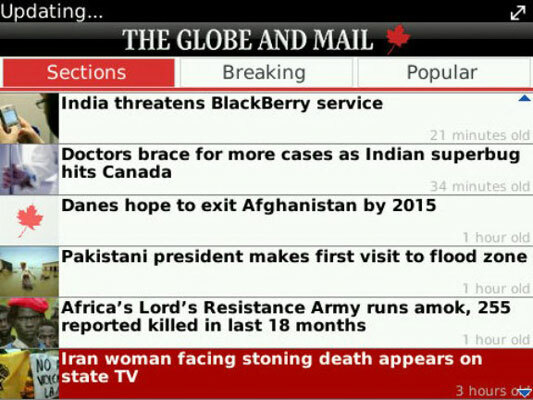 There’s a great deal of news about politics and events in Canada, but the international coverage is also first-rate. Navita Sports, from Navita Software, is a work in progress, but it does one thing particularly well: delivering easy-to-read, well-organized information about sports. To be precise, this Brazilian company has launched its product with sports that are of particular interest in its part of the world: Formula 1 car racing, professional football (what Americans call “soccer”), and professional tennis. 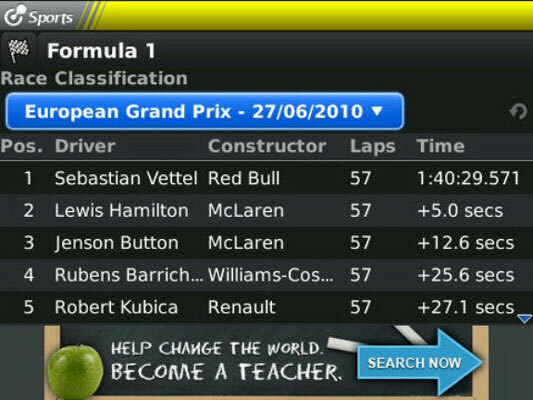 Game times are based on your local time zone, and interfaces are available in English, Portuguese, and Spanish in the first release. The free version comes with an ad banner across the bottom. For a small annual fee you can turn off the ad. 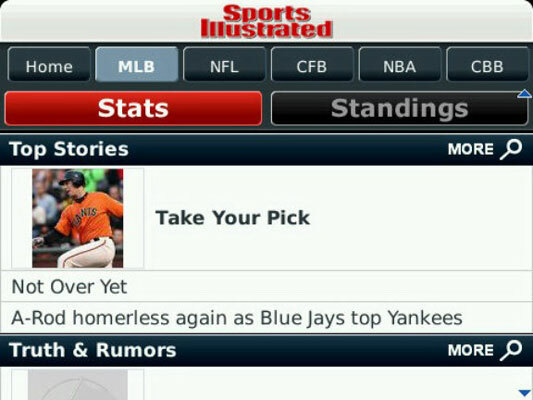 For more than half a century, Sports Illustrated has been the publication of record for sports fans. The app includes shortened versions of the think pieces and columns that run in the magazine, along with a sampling of photos. And it blends in some up-to-the-second information: scores of major sporting events while they occur, updated statistics and standings for leagues, and breaking news in the world of sports. You can personalize your front page, and you can choose whether the app stays active in the background, grabbing scores and headlines from the Web; the alternative is for the app to update itself only when you open it up on your BlackBerry. The mobile version of TIME magazine offers the chance to browse through color photos and special sections, including weekly lists of things you need to know. It includes many of the news articles, analysis pieces, and columns from the print version, and it also adds current headlines, updates, and blogs. When you add this app to your phone, you receive updates automatically, and you can read them even when you’re not communicating with the Web. And it has a bit of style: The hallmark red border of the print magazine lives on as an accent above the mobile version’s front page.